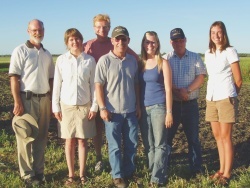 Martin Entz with members of his research team in 2007. This website is produced by Martin Entz and his research team in the Department of Plant Science in the Faculty of Agricultural and Food Sciences at the University of Manitoba. Martin works on sustainable agricultural systems together with fellow researchers, students, technicians, farmers, and interested citizens. 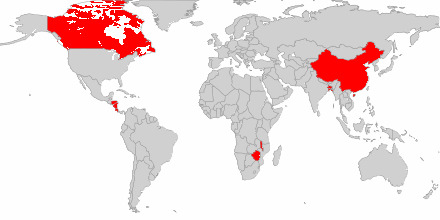 Some team members are based at the University of Manitoba, while others are located elsewhere. Technician Keith Bamford (on tractor) prepares for a field day demonstration. We are conducting research in collaboration with other institutions such as Agriculture and AgriFood Canada, other Canadian universities and the Land Institute. This research involves short and long-term field trials, on-farm research, as well as plant breeding programs. We are giving farmers and farm advisors the opportunity to learn about natural systems crop production at field days and field clinics. We are also making research results available on the world wide web. 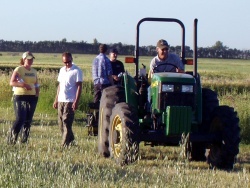 Members of the Natural Systems Agriculture laboratory work across Canada and around the world. The Canadian work has long focussed on designing sustainable, productive and resilient agricultural systems that empower people. Our work started in the prairie region but has now expanded to include activities in most provinces. Our anchor study is the Glenlea long-term rotation experiment, located in southern Manitoba, which is Canada's oldest comparison of organic and conventional crop production systems (since 1992). From 2006 to 2013, we worked with three Central American Universities (Nicaragua, Honduras and Costa Rica) on systems to reduce pesticide use in crop production and to reduce pesticide exposure to indigenous populations. Our lab's contribution was to support technical innovations in organic farming. Since 2009, we have been actively engaged with Lanzhou University in China on aspects of integrated farming systems. Dr. Martin Entz and Dr. Doug Cattani (Dept. of Plant Science, U of Manitoba) have co-chaired the collaboration which includes research and education in grasslands, conservation agriculture and organic farming methods applied to the Loess Plateau region of Northwest China. Since 2012, we have been involved in conservation agriculture research and development work in Zimbabwe, Malawi and Bangladesh. This work is conducted in partnership with the Canadian Foodgrains Bank and the University of Manitoba’s Global Public Health Centre. The collaboration with health care colleagues focusses on promoting Maternal and Newborn Child Health. The University of Manitoba's Department of Plant Science conducts research at a number of locations across southern Manitoba. Our research facilities include those located on the University of Manitoba campus (the Agriculture Building and "The Point"), the Carman Research Station, and the Glenlea Research Station. We also carry out research in collaboration with other organizations including the Manitoba Zero-Tillage Research Farm and Agriculture and Agri-Food Canada.